Why do I continue to focus on fighting back against narcissists when I could easily let it go and move on? I have learned to let go of the past in all aspects of my life, but just because we let things go, it does not mean the memories and lessons have disappeared. I view 'letting go' of things as no longer allowing the memories to hold me back or drag me down. This is a difficult thing for abuse victims to do, but it is possible! So how do we let things go when they continue to haunt our thoughts? Narcissistic abuse is designed to keep these feelings going on a constant basis so that you never get relief, stay in an uncontrolled state of mind, and keep going until you crash. Most current research states that the best way to heal is to leave the situation and have 'no contact' with the narc. What this does is give you a chance to deal with those things haunting your mind, and start rationalizing your conflicted feelings once again. This could take weeks, months and even years to do depending on the level of abuse suffered. Again, it is one thing to let go of the toxic thoughts and feelings over time, but another to begin rebuilding your confidence and self esteem As a mental health worker, I agree a promote the idea of no contact with my clients, but I do not stop there. I teach from a place of knowledge and experience, and share what works, and what doesn't. For today I am focusing on what to do once you have let things go and have brought balance back to your self. Even though we heal the 'self', the problem still exists out there in the social world. For some of us, we can let that go and move onto other things, but for people like me who have a deep desire to see social justice done, I can not simply let the problem go, just the negative things within myself. Dealing with the problem can be a huge part of the healing experience. There are three basic premises for behaviours and I will use them here because they are quite relevant to my explanation. There are passive (permissive is a commonly used term as well) people in the world who will always be passive, and there is nothing wrong with this, the world needs a balance of each behaviour type. After healing the 'self', a passive person can move on without holding onto the social aspect of abuse. I am not a passive person, so I will look to the next behaviour. 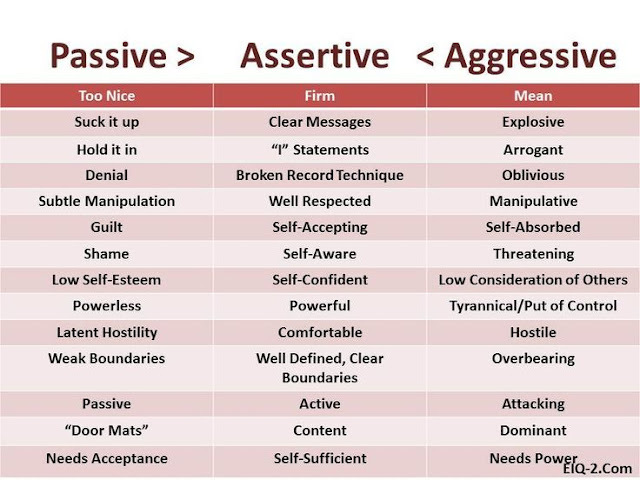 Authoritative (aggressive is the other behaviour commonly used here but I am using authoritative for my own purposes) people will not simply be able to let go after healing, and will often look for ways to fight back in aggressive ways. They will often feel anger and frustration that will not simply dissipate, and this will likely fuel their efforts to fight back, and if they cannot let go of these negative feelings and thoughts, they will never be able to fully heal unless they can find something to appease their inner toxicity. I am not an authoritative person, so I must be in the third behavioural group. I am kind and empathetic, but certainly not passive. I am peaceful in nature most of the time, and do not take an authoritarian approach to life, so therefore I must be Assertive. This is a balanced combination of both. I can let simple wrongs slide by, and I don't need to be in charge of situations, but I also don't allow stupidity to run freely around me. I like to right wrongs where I see them while also bringing balance and peace to the world. I have let go of the past and it does not weigh me down in any way right now. I am at peace. Here is the thing, peace is wonderful, but also boring after a while. If life were meant to be simply boring and peaceful, we would all meditate all day and the world as we know it would fall apart. Eckhart Tolle teaches the Power of Now, which is essentially find peace in the present moment. He has led many people around the world to peace and I commend him highly for that. He helped me greatly along my own path and I am grateful, but he missed the next step that humanity needs. We need purpose and something to drive us to get out of bed each day. If you want to be passive and live and peace, all the power to you! If you want to be authoritarian narcissist, feel free to do so, but you will be preying on the passive people of the world, and guess what, us assertive beings don't like that so much! The empathetic assertive persons of the world are here to bring balance back by protecting the passive, but also by fighting the authoritarians. The authoritarian narcissists will continue to grow and expand their power and wealth if nobody stops them, and it is certainly not the passive people who will do it. Peace will only last as long as there is balance in these social behaviours, so if you are passive person you may want to change your way of thinking. Find peace, but once you do, find purpose. Once you discover how wonderful peace is, you want to have it all the time, but again, peace cannot exist when our world is out of balance, so essentially if you are living in simple peace right now, then you have become part of the problem. In the middle of all this are a handful of assertive people out there trying to find ways to bring balance back to the chaos being created around us. I see this being solved in one of two ways, or maybe both combined; the assertive people will bring down the authoritarians in one way or another, or we will find ways to gather the passive beings and turning them into assertive beings as well. Either way will begin to bring balance back, and both together would work even faster. I know i am a little 'off the rails' today but this is a large discovery that I am attempting to solve for myself. So on the greater picture of things I will try to put it all together now. There is a reason why my articles are all over the place, from awakening to enlightenment, to mental health and to narcissism, because they all tie together in the larger scope of things. There is a great imbalance in the world right now and our social systems are falling apart. We can see a growth in narcissism and evil, but also in empathetic beings. I found inner peace a long while back, but outer peace is another thing completely. Inner peace is blissful and I could have easily stayed there for the rest of this existence. You will not find a drug in the world that will make you feel that good, and it was natural. It did take a lot of pain and suffering over the years to get there though, and it was all worth it. After a few months of this I got very bored. I was content and pain free, but something was still missing, purpose. After re-engaging the world, I found more pain and suffering and often asked myself why I was, and am still putting myself through it. There past few years have been rough, but the things I have learned not only kept me going, but have begun to show their purposes. There is a war going on around us and most people can't even begin to see it, yet I can see it clearly! I urge everyone to find peace, but also not to stop there. Find peace and then find your purpose. I several current purposes and this blog is one of them. It helps me to solve social issues by not only explaining them to my self here, but also to share with others who are trying to solve these issues. NPD is at times an overwhelming issue, and I can almost guarantee that every one has been affected by it in one way or another. The narcs are the authoritarians, and if you have been abused, you have been likely pushed into a passive state of being. If you are in a passive state, use it to find peace and stop letting yourself be abused. Once you find peace, you will find the power and strength to become an assertive being again. Not only will you have peace, but you will also start fulfilling your inner purpose. Your inner purpose is likely frustrated and angry at a narcissist if you are reading this, and that is exactly how you are supposed to be feeling. Your passive brain is telling you to just let it go and that maybe it will get better. It won't on its own! Get away from the Narc, practice no contact, find peace and heal, then serve your inner purpose. You have to believe you have suffered for a reason, and you have! You needed to learn what it feels like to be abused so you can use your empathy skills to help others! That is your purpose! Remember this though, you cannot pour from an empty cup, so always make sure you have the strength to fight before you do, or you may become an angry authoritarian as well. I am practicing my assertiveness here once again, and I plan to both help the passive while bringing down the authoritarians. It must be my purpose, because every step I take on this path brings me both strength and peace at the same time. I hope you find peace and then join the fight to bring balance back to the force. May the force be with you!